If the 20th century was the age of science and technology, then the 21st century is the age of data and information. 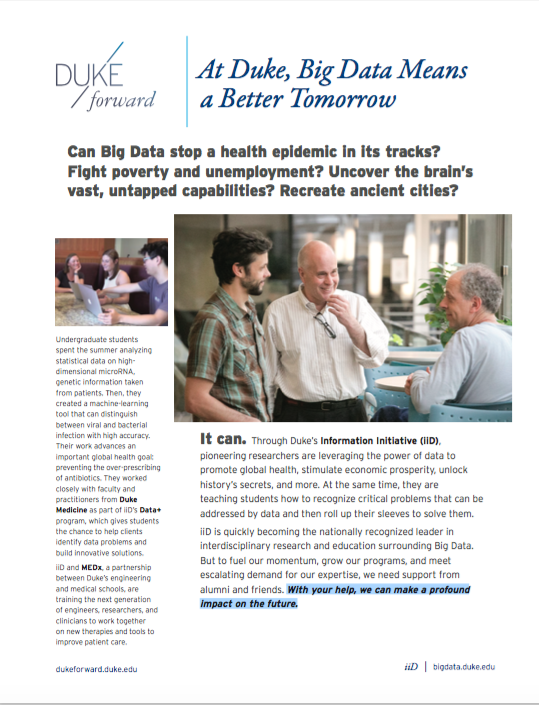 With the Rhodes Information Initiative at Duke (iiD), we’ve placed ourselves as leaders in the field of big data. For data to serve society and improve people’s lives, it must be marshalled, entangled with other data sets and information, and probed to answer big questions, such as how to prevent disease, how to navigate global financial markets, and how to meet growing world demand for energy. Grand challenges demand brilliant, collaborative innovation across different fields. Duke is starting to generate answers on a grand scale as Rhodes iiD-affiliated faculty break new ground in the humanities, social sciences, life sciences, and medicine. Bringing big data expertise to bear upon big questions is amplifying the impact of Duke’s signature interdisciplinary culture. As Rhodes iiD has taken hold, the Duke community has responded by not just asking for—but demanding—more opportunities for analysis, engagement, and collaboration. Our next challenge is to expand our ability to respond to these requests for teaching, training, and research. Your support and advocacy is critical to building Rhodes iiD’s capacity, sustaining its momentum, and fueling its trajectory toward becoming the nationally recognized leader in interdisciplinary research, application, and education surrounding big data. 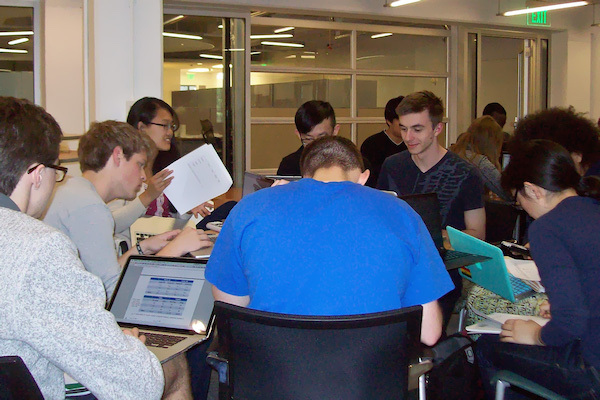 From mathematics to medicine, and sociology to statistics, Rhodes iiD brings together the greatest minds at Duke. Together, we can teach future generations to live, work, and lead in a data-driven world. Let’s empower tomorrow’s leaders to move the world forward with Big Data. Can Big Data stop a health epidemic in its tracks? Fight poverty and unemployment? Uncover the brain’s vast, untapped capabilities? Recreate ancient cities? It can. With your help, we can make a profound impact on the future.